This article explores the investigative methods used by corporate security within organisations concerned about prop- erty misappropriation by their own staff and/or others. The research methods are qualitative: interviews, observations and case studies carried out between October 2012 and November 2015. 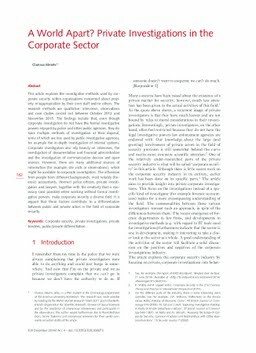 The findings include that, even though corporate investigators do not have the formal investigative powers enjoyed by police and other public agencies, they do have multiple methods of investigation at their disposal, some of which are less used by public investigative agencies, for example the in-depth investigation of internal systems. Corporate investigators also rely heavily on interviews, the investigation of documentation and financial administration and the investigation of communication devices and open sources. However, there are many additional sources of information (for example, site visits or observations), which might be available to corporate investigators. The influences from people from different backgrounds, most notably (forensic) accountants, (former) police officers, private investigators and lawyers, together with the creativity that is necessary (and possible) when working without formal investigative powers, make corporate security a diverse field. It is argued that these factors contribute to a differentiation between public and private actors in the field of corporate security.